This email provides information about Microsoft's technical response to the FairUse4WM circumvention tool that is currently circulating on various Internet sites, which decrypts content protected by WMDRM. 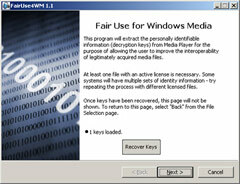 On September 19th, 2006, Microsoft released a new update to the Individualized Blackbox component (IBX) which thwarts all currently known versions of the FairUse4WM circumvention tool. Supported platforms at this time include Windows Media Format SDK 9.5 and Windows Media Format SDK 11 Beta 2 on Windows XP, as well as the version of Windows Media Format SDK 11 that ships with Windows Vista Release Candidate 1. This update is not yet available for the Windows Media Format 9 Series FSDK or for users of Windows XP Media Center Edition 2005 Update Rollup 2. Users of Windows XP Media Center Edition 2005 Update Rollup 2 can be encouraged to download and install Windows Media Player 11 Beta 2, which is compatible with these robustness updates. Get the secure DRM component (individualization) version. 1) Send them to this web site, which will force a re-indiv (requires Internet Explorer). 2.) Use the FSDK APIs referenced below, which will force a re-indiv (requires an FSDK Certificate). If you have any questions, comments, or concerns, please contact [email removed]. Thank you for your continued understanding and confidentiality as we resolve these critical matters.